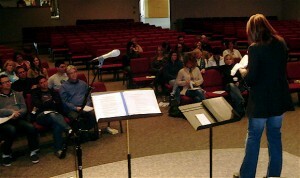 Leann speaking to the Johnston Evangelical Free Church worship teams in Johnston, IA. It was a great weekend!! So many people who lead worship or play on worship teams, have no idea of how powerful and significant they are to the body of Christ. Carl and I delight in empowering church worship teams in their calling on every level….spiritually, mentally, and musically. Like the Army, we’re calling them forth to be ALL THAT THEY CAN BE. The Lord, God Almighty is calling churches and worship teams to step out in boldness and confidence to bring the Presence of the Lord for the people. For more information as to what the Team Training weekends are like….more info. It was a treat to have you and Carl with us for the weekend. Your comments and spirit were a breath of fresh air. Please feel free to drop in if you are in the area. We’d love to spend some more time with you two. Thank you so much, Scott. It was a pleasure to meet your team and pastor that weekend. I hope our paths cross again sometime soon. Many blessings to you and send your team our love.